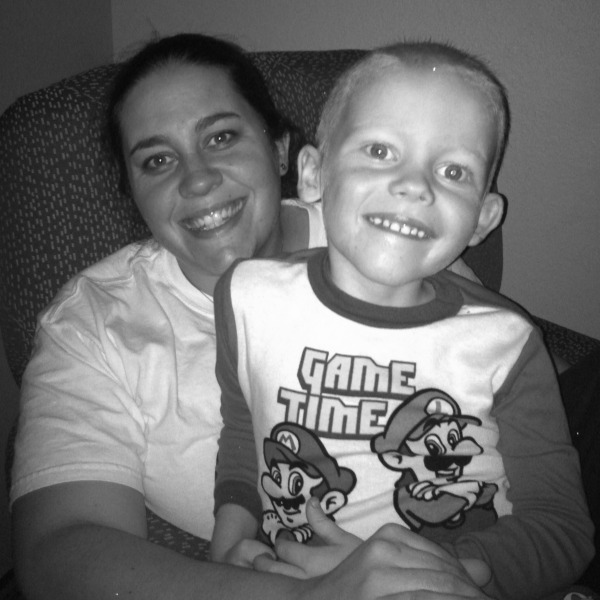 Mikelle and her son, Ryan, in 2011. Ryan was diagnosed with acute myeloid leukemia at the age of 5 and passed away two days before his 6th birthday. Today you had your son, Ryan. Isn’t he beautiful? Red hair, 6 pounds. A few weeks early, but he is perfect. This letter you’re about to read is things you should know. Things you should have known before your child was diagnosed with cancer. Yes, your son will have cancer a month after he turns 5. First of all, realize that any child can have cancer. Nothing you do or say, not even love, can stop it. It doesn’t discriminate based on race, financial status, or the age of a child. Researchers still have no idea why some children get cancer. Educate yourself about childhood cancer. You’ve heard of it; you just didn’t pay attention because it didn’t affect you. All you know is the St. Jude commercials of the cute little bald children, smiling and dancing, and you’ve heard that there is an 80 percent survival rate if they do ever get cancer. Doesn’t seem like a big deal. It just isn’t something you’ll ever have to worry about, right? Hate to burst your bubble, but the things you will see and learn once your son gets cancer will ruin your preconceived ideas of children with cancer. Not only will it open your eyes, but it will truly change your very being to the core. You’ll learn that Ryan will indeed dance and be bald, everything the commercials showed you. But you’ll also learn that he will be so sick, he will be confined to the bed for weeks at a time. That he will be put to sleep so many times for countless procedures, you will lose track. He’ll be in the PICU numerous times and in the end, for a long six weeks. You will also find out that many children do not die from the cancer, but from the side effects of the treatment that is supposed to cure them. This is how you will watch your son die. Am I shocking you yet? Are you going to read this letter and take it to heart? Will you pay attention to the words “childhood cancer” now that you know your son will die from it two days before he turns 6 — exactly five years and 363 days from the moment you hold him for the first time? Am I shocking you yet? Are you going to read this letter and take it to heart? You will fight every day to warn others, to beg them to understand that you were the one who said, “It won’t ever happen to my child.” You will watch countless other families face the same heartbreak you have. Kel, in the United States, seven kids will die today, and 36 will be diagnosed today. Remember this fact. Remember only 4 percent of the federal budget for cancer research goes to the children fighting cancer. Learn that acute lymphoblastic leukemia, or ALL, is the one with the high survival rate. Ryan will have acute myeloid leukemia, or AML — completely different. Yes, there are different types of leukemia. There are also several other childhood cancers that will become part of your daily vocabulary: brain and other nervous system tumors, neuroblastoma, Wilms tumor, lymphoma, rhabdomyosarcoma, retinoblastoma, and bone cancer (including osteosarcoma and Ewing sarcoma). Those are some of the more “common” childhood cancers. I want you to start donating to childhood cancer research now. To start caring now, before Ryan gets cancer. You need to educate yourself so that when it happens, you will know a little something. Maybe if you do these things, you will save him because they will find a cure by September 22, 2011, when he is diagnosed. The future you is sitting here kicking herself for not knowing more about childhood cancer. I want to save you from the regret you will feel, the heartache you will have with every breath you take. Most of all, I want to save Ryan. The future you is sitting here kicking herself for not knowing more about childhood cancer. My hope is that one person will read this that was like me, seven years ago, and speak up and reach out. That they will fight for their child even though “it won’t ever happen to my child.” Maybe it will be their grandchild they will save when they donate their money and time to help raise awareness. Maybe it will be a neighbor’s child, a niece or nephew, a friend’s child, or a stranger’s child they will save by becoming aware and donating to research. I can’t go back and fix my mistakes and bring Ryan back now, but I can speak out. I want people to speak out to save their child before it happens to them. If more people had spoken up 10 years ago, maybe, just maybe, Ryan would be here with you still, 7 years old, and just starting second grade. I hope you have learned something from this letter, Kel. Don’t believe those TV commercials anymore or the bare-bones facts you know at age 26. Instead, care enough to find out the real facts because it won’t go away, and ignoring it is not protecting anyone’s child — especially that sweet baby boy you are holding in your arms at this moment. Breathe it all in, take nothing for granted, and kiss him for me.